She’d decided to wear her green dress that buttoned down the front, her brown-and-green sandals and straw bag. She liked the way the skirt of the dress swung when she walked. She had earrings almost the exact color of that dress too…. She went to the door when she saw Thelvin driving up. Jimmy’s was 20 miles outside of Farleigh… The building was born a barn one of the farm building where Jimmy’s daddy and granddaddy had housed their mules, cows, pigs and chickens. The year Blanche left for Boston, Jimmy had come home from Chicago… he leased out the fields and opened the club. None of the customers knew if the place was legal, and no one cared. What mattered was that black folks had a place to go eat, drink, and, more important, to dance – not hip-hopping, house-music-loving youngsters, but people for whom the blues was the listening and dancing music of choice. observations: It’s Labor Day in the US today, and the wonderful Blanche is the American working woman I most want to celebrate. I’ve been very much enjoying the re-publication by Brash Books of the Blanche series – see earlier entries here and here, where I describe how they were ground-breaking and revolutionary when they first appeared. The books are still a great read, and I really enjoy the descriptions of Blanche’s life, family and friends, the frank comments on race relations in the USA, and the crime plot as well. I think Blanche is around 50, and – black or white – there aren’t that many protagonists who are women that age, and I like that too. In this one Blanche has returned to her hometown of Farleigh in North Carolina, and is getting involved in a catering business run by her best friend – I found the details of that fascinating too. And, for Labor Day, boy does she work hard, always. But what choice did she have? She didn’t want Thelvin to think she was too cute to eat with her fingers, and she was hungry. The crime plot was quite complex: it looked as though it was going to be fairly obvious, but Neely had some twists up her sleeve, and took me aback more than once. 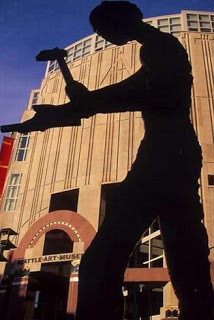 In a previous Labor Day entry I featured the enormous sculpture of a Hammering Man by Jonathan Borofsky, 48 feet tall, celebrating workers everywhere. He is outside the Seattle Art Museum, his arm "hammers" silently and smoothly four times per minute from 7 am to 8 pm every day, and it is a splendid sight. But he always has Labor Day off, so is immobile today. A terrific choice for Labor Day, Moira. And like you, I'm very glad that the Blanche series is enjoying new life. It is a terrific series, and I like her character quite a lot. You're reminding me, too, that I want to do a spotlight on one of these novels. Thanks for the nudge. Please do Margot - I would really value your opinion on these books. Well I'm truly convinced - thanks Moira, a new series I really want to sample. Do give them a try Sergio - I find it difficult to describe exactly what I like about them, and they may not be to everyone's tastes, but they are good honest books. I am sure I am repeating myself. I have the first one and I should get to it sometime soon. Probably not before 2016 though. I read the series years ago and loved it then. Friends loved it. I was sad that it finished after four books, and keep hoping that the writer will restart the series. Love the photos here. Did not know about the statue of the worker hammering. Just round a nice interview from earlier this year with Barbara Neely, activist, as well as writer. She looked to Toni Morrison as a prototype for her writing. Can't beat that. Morrison won both the Pulitzer for Beloved and the Nobel Prize in Literature. Yes indeed. How interesting, is the interview with Neely online? - I'd love to read it.